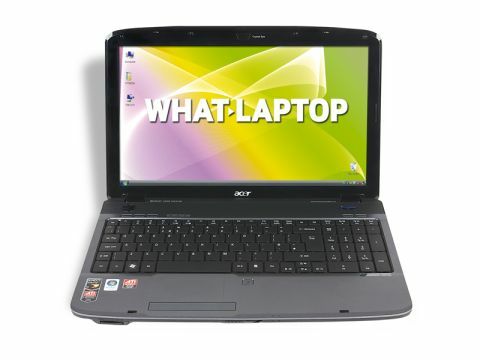 Acer is a highly popular and successful name in the laptop market and produces a wide range of high-quality corporate and consumer laptops. Its Aspire range targets consumers and the 5536G-744G32Mn is hard to beat at this price point. While the 2.8kg chassis is wider than most laptops of similar screen size, its slim depth makes it suitable for use around the home. The 153-minute battery life falls below the three-hour minimum we expect from a modern laptop, but allows basic travel use. Build quality is impressive for such an affordable device, with sturdy plastics used throughout all areas of the chassis. The glossy lid attracts scratches and smudges, however, so suitable protection will be required to prevent damage on the move. The user interface is unique among this type of machine. The keyboard has keys raised high above the chassis, which provides an eye-catching look and makes it easy to differentiate between keys when typing at speed. Dust and dirt can easily accumulate beneath the keys, however, which may cause issues with responsiveness. The large touchpad incorporates gesture control functionality to improve usability. Pinching your fingers together on the pad lets you zoom into photos, for example. A button alongside the pad can be used to disable it when necessary to avoid accidental activation when typing. Rather than use an Intel processor, Acer has opted for an AMD chip. While it fails to match the power of its rivals for raw processing power, it runs quickly and smoothly enough for most daily use, including word processing, browsing the internet, watching DVDs and viewing photos. Conversely, graphics performance is ample for the intended user. The ATI graphics card is designed for processing high-definition video and provides enough power for mid-level gaming, as well as editing digital photos and videos. This combines well with the 15.6-inch Super-TFT screen. Its widescreen design makes it ideal for watching movies and viewing photos. It isn't the brightest panel we've seen, but images are extremely sharp, with strong colour and contrast. The 320GB hard drive is extremely capacious for such a low-priced laptop. The dual-layer DVD rewriter and 5-in-1 card reader provide read/write access to CD, DVD and flash storage cards. Basic Microsoft office tools are also included. Although the Aspire 5536G is not the most powerful or portable laptop around, its unique usability, stylish design and impressive features make it a great choice at this price. For home, office or family use, you won't be disappointed.